We Offer Professional Alloy Wheel Repair, Refurbishment & Customisation - Browse The Website Or Contact One Of Our Branches For More Infomation About Our Range Of Alloy Wheel Repair & Customisation Services. Wheel Pro Scotland are experts in alloy wheel diamond cutting. We repair & refurbish diamond cut alloys using our machining process, saving customers a fortune against the cost of replacement. Wheel Pro Scotland provide professional powder coating services in Edinburgh & Glasgow. This extremely durable, highly customisable finish comes in a verity colours. Looking for outstanding alloy wheel refurbishment, with guaranteed quality finishes and durability? Whether you’re looking for an alloy wheel repair or would like to try a fresh new colour on your wheels, contact one of our branches in Glasgow or Edinburgh, they’re always happy to talk wheels! 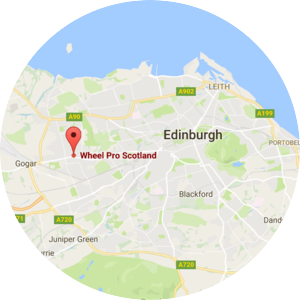 Wheel Pro Scotland have developed our alloy wheel repair services to exceed our customers’ expectations. We aim to offer unparalleled levels of service and expertise. Here`s why we think you should choose Wheel Pro to take care of your alloy wheels. 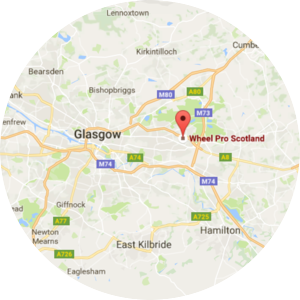 With branches in Edinburgh and Glasgow, Wheel Pro Scotland have the central belt of Scotland covered, you`re sure to have a branch near you! We`re happy to offer advice on alloy wheel repair, refurbishment & customisation. Pop into our Glasgow or Edinburgh branch for a chat with one of our experts today! Save time with our Online Booking Form. Simply fill in your details & book yourself into one of our branches in Glasgow or Edinburgh. We`ll take care of the rest! Need you alloy wheels repaired in a hurry? We offer same day alloy wheel repairs, contact your local branch for more information. Wheel Pro Scotland offer a huge range of alloy wheel finished. Our customisation service will ensure your allow wheels stand out from the crowd. For more detailed information about our alloy wheel repair & customisation services available from our Glasgow & Edinburgh branches, click one of the service icons below. Want to find out more about your wheels? If so we`d love to hear from you! Simply fill in the form below and one of our experts will be in touch to discuss your alloy wheel refurbishment, repair or customisation requirements in more detail. Copyright © 2019 Wheel Pro Scotland. All rights reserved.